Sometimes it is the small things that hold attention, like a ladybug on flowers, those twinkles in someone’s eye or the rust marks on a nail! There were plenty such things at and around Te Aroha, Dhanachuli and I decided to do a photo feature on it. 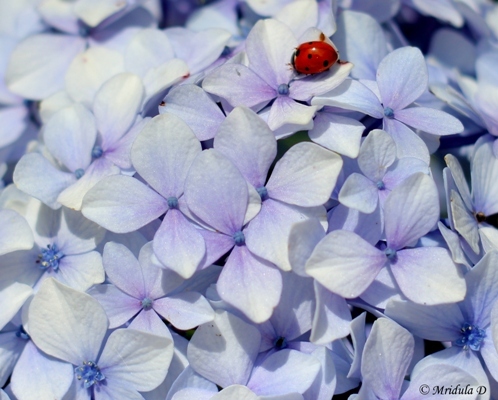 I start with the ladybug on Hydrangea flowers. Next to catch my eye was the hanging arrangement of the bath accessories in the bathroom of the Long House (my room) which were hanging from the ceiling beautifully. I had to bring my camera to the bathroom as soon as I saw it! 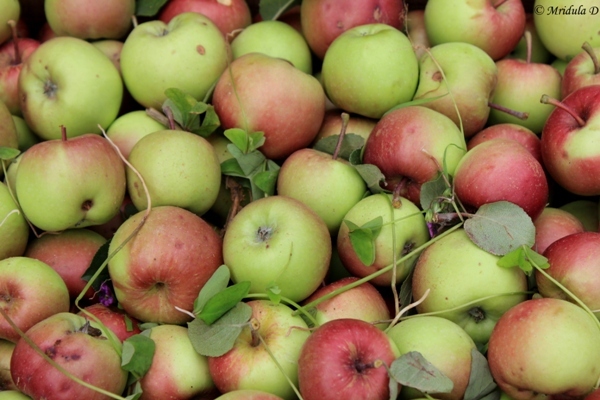 Then there were apple and pear trees all around Te Aroha and I spent quite sometime clicking them. They also attracted a lot of birds but this time my bird shots did not turn out too well. 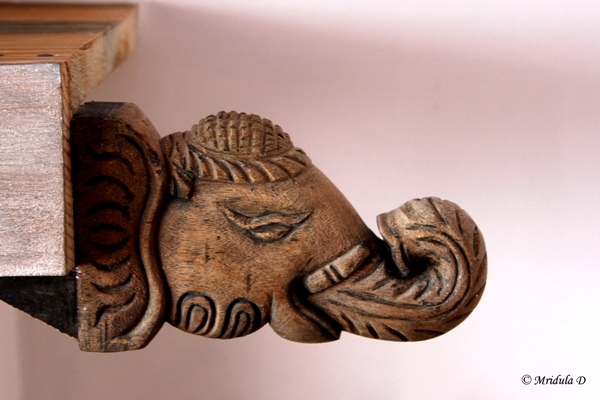 This elephant carving was part of the book each in my living room at the Long House and how pretty it looked! It had to be clicked. 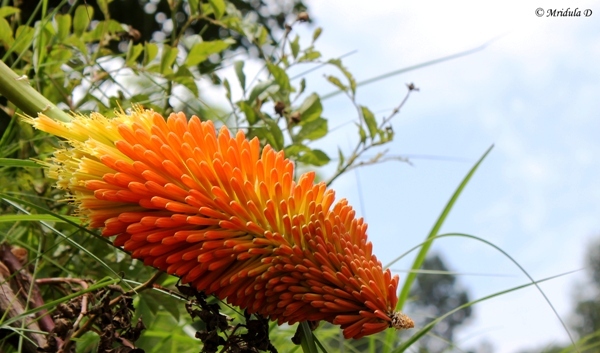 I spotted this torch lily on the drive to Dhanachuli from Kathgodam Railway Station and I was looking for an opportunity to click them. 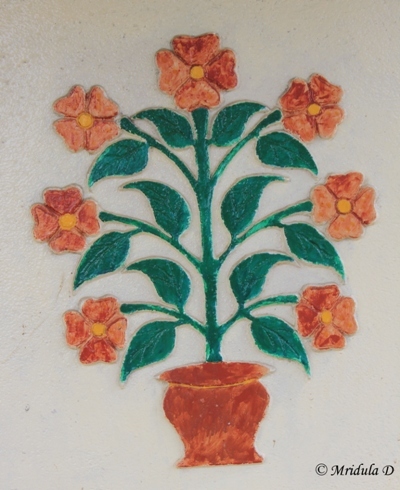 I got it when we did the Old Dhanachuli village walk. Not on the walk exactly but I requested the driver to stop the car so that I could click the flowers. Thankfully there was space to stop the car without blocking the traffic. Otherwise the mountain roads can be really tricky in that sense. 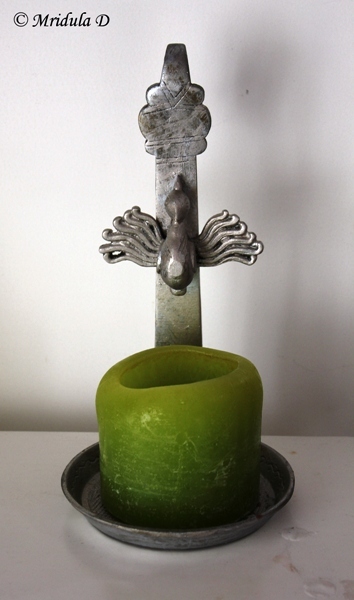 And finally this was one (of many) beautiful candle stand from my room. They lit all the candles at night and it was quite beautiful. Small things, they usually leave such big impressions! Don’t you agree? On my first day at Te Aroha, Sumant asked me if I would like to go for a walk to the old Dhanachuli Village the next morning. I was game for it, after all I had just come back after trekking in Nepal. We were also starting leisurely after the breakfast. For breakfast I had puri bhaji without any guilt because I knew I was going to walk. 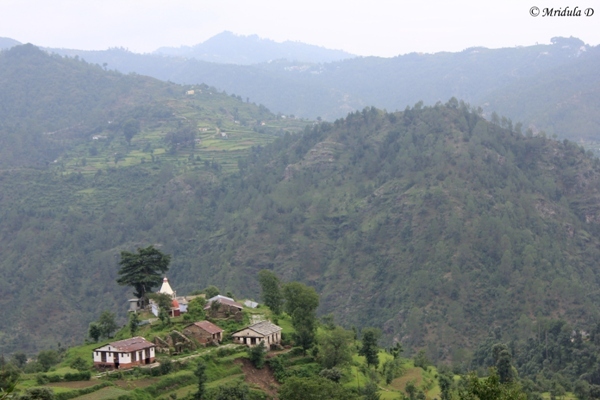 We took the car for a short distance and from the road head we started to walk towards the old Dhanachuli village. The way goes downhill to the village. It is a decent path as far as kaccha routes go. I mean there were not too many loose stones that would start rolling as soon as you try to step on it. Anyway I find it difficult to go down as my knees hurt but this was half an hour walk (for me) and soon we were at the village temple. 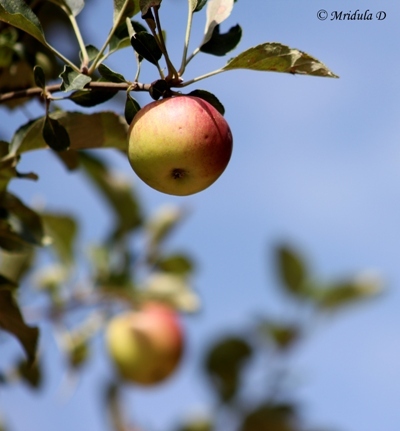 On the way we crossed this old house which the owners use as a godown and they were storing apples there. Sumant mentioned that the house is about 100 year old. 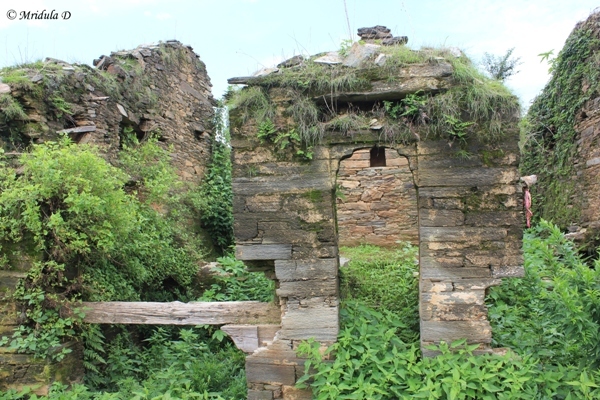 Sumant mentioned that the old village was abandoned when the road came up at Dhanachuli. 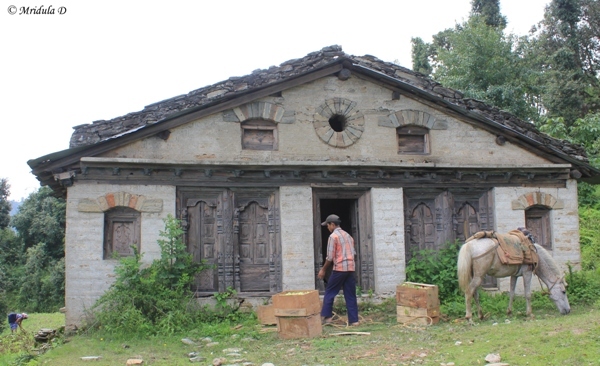 There are two families who still maintain their residence at old Dhanachuli as that might be close to their fields. While getting down I did say to Sumant that some of his guests would find it difficult to climb up all the way back and he agreed. He said some take about two hours to climb back. The houses have been vacant for such a long time that nature is trying to claim it back. A lot of them still have beautiful woodwork in various stages of decay. It was fascinating to talk about it to Sumant who knew a lot about the area. There is a well maintained temple in the middle of what is left of the old village. Sumant mentioned that it is still functional and used for large prayer gatherings. We had a cup of tea there (carried from the hotel, there are no tea shops otherwise in the area, other than on the road head) and then we started climbing back which was uphill. While we were sipping tea Sumant remarked, “It took us just 30 minutes, maybe even less to reach here.” I was not paying much attention, my knees were still a bit sore from my Annapurna Circuit Trek. We took a gentler path to walk up and this one was also good, not too many rolling stones trying to trick you. Anyway I am marginally better while going up, I only get tired. Whereas while coming down, I am usually in pain. 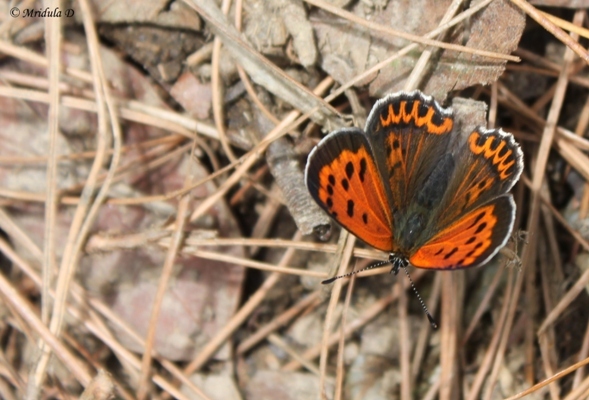 So we walked back, I clicked this beautiful moth/butterfly and soon we were back to where the car was. The car was there but the driver was not. Sumant remarked that we just took 1.45 hours and the driver was not expecting us as it usually takes an hour more. I was so happy to hear this. I am a slow trekker in reality. On this recent trek to Nepal there were fit young men who would reach usually 2 hours before me to any place. At least at some place I was faster than the average! Soon the driver was located and we headed back to Te Aroha. If you get a chance, do go for this walk. I thoroughly enjoyed it. 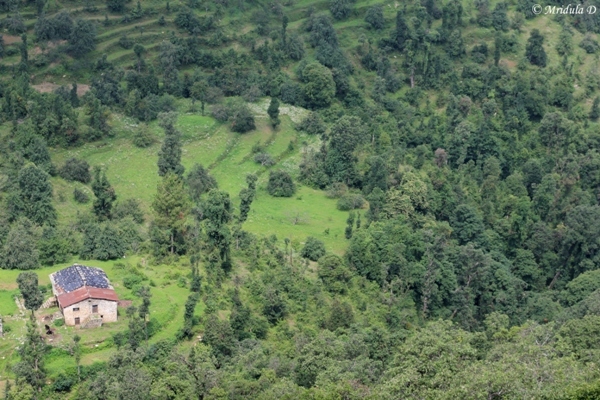 Te Aroha is tucked away in a snug corner at Dhanachuli, Uttarakhand. It was the former summerhouse of Asha and Sumant Batra. 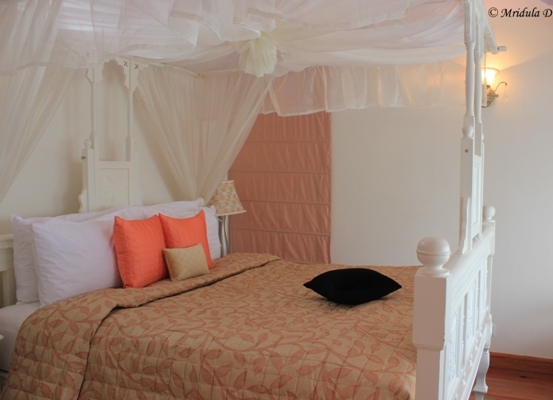 It gradually got converted into a 10 room hotel that is built with a lot of love and care. And you can see it in every corner of the place. 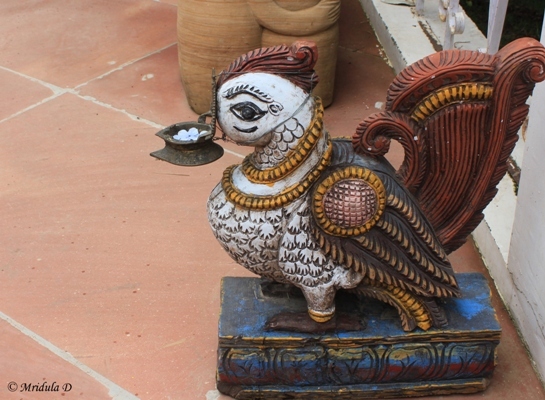 While I would walk the pathways I would often stop to look at a curio and wonder, “How did I ever miss it the first time?” For example, this pretty bird was in a prominent place and yet there was so much to see, I missed it the first time. I can actually fill this post with such cute things but I will do a photo feature of small things around Te Aroha separately. And if you are wondering why I went to Uttarakhand so soon after the floods you can read about it in detail here and here. The journey from Anand Vihar Railway Station to Kathgodam was routine, I had tea, ate breakfast and fell asleep in the train because I started at 4.15 am from Gurgaon to catch the train. I was received by the car and driver from the hotel and it was a smooth 2 hour drive to Te Aroha. Now I have to take Avomine (medicine for motion sickness) on the mountain roads but even through my Avomine filled haze I liked my room on the first sight! It was beautifully done and was quite inviting after an eight hour journey. The bathroom was an absolute delight and I had a living room too, all to myself. There was a piano in the living room but having no musical talents whatsoever I did not inquire about it further. I later got to know that the four poster beds in the hotel are about 100 year old! Once I got out of my room, which I did reluctantly, it was time for lunch. The food at Te Aroha is wholesome and done with a lot of care. 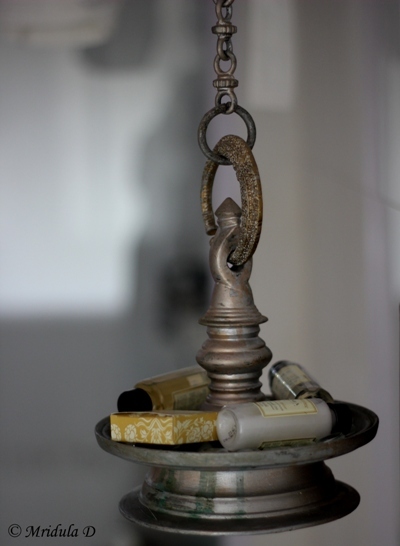 During my stay I had both Indian and continental and liked it all. There tomato shorba on a cold night was an absolute delight. I saw a mom requesting Maggi for son, who would not eat anything else, as well. In my conversations with Sumant I got to know about the proposed expansion plans. He plans to add a museum of his collections along with a tea house to the hotel. He has an exotic collection of things, curios, advertisements, bollywood posters and a Vijay Super scooter as well! I have never seen so much reading material at any hotel. Now traveling alone, I never venture without my book but at Te Aroha I would have been fine. There was so much to read that I would need months to finish even those books that I liked. Te Aroha is primarily a romantic getaway. Almost everywhere there are pair stories on the walls. There are some rooms that are given only to couples. 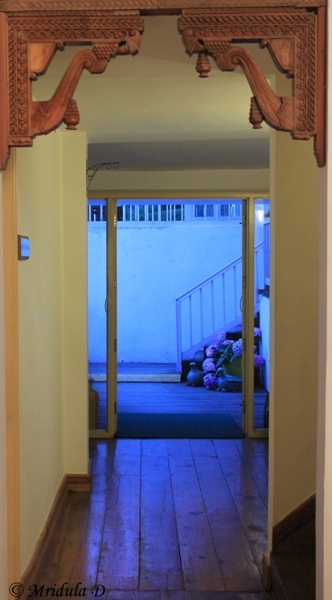 I saw three rooms, the Long House, where I stayed, the attic room and the master bed room. I would say I had the best bathroom but I liked the attic room a lot because well it was in the attic! The master bedroom has a private garden as well. When I asked Sumant if the hotel was done by a professional interior designer, he confirmed what I suspected. He was the brain behind the concepts and had professional help. 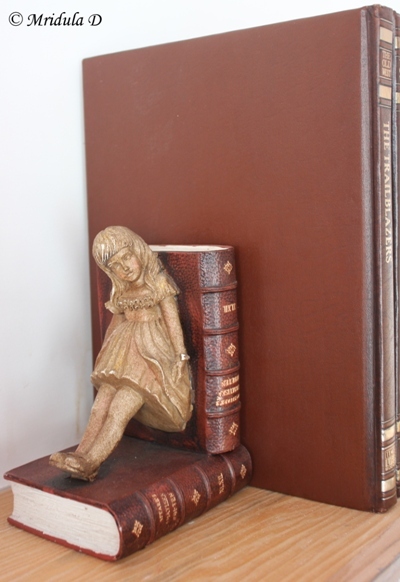 It shows, in the poems in my room, the small treasures all around, the books, the music and in the whole atmosphere. It is top class but not all color coordinated and brushed to distraction. Te Aroha has a cozy feeling to it, as if you were a guest in someone’s home, rather than at an well done but impersonal hotel. Tucked away within the lap of nature Te Aroha has big decks to sit and get lost in nature, in a book or your significant other if you wish. You are bound to come back relaxed but probably with a hangover like me, the high altitude hangover, which gets worse in the plains. PS. I was invited to the hotel and I am so happy that I was!